At the early age of 7, Steven started kart racing. His Father, Armik Aghakhani, an avid racer and car collector, saw a natural hunger in Steven for speed and driving. As Steven began to graduate his driving skills from kart racing to exotics, he began training with Michael Essa (2013 Formula Drift Champion). Steven has trapped record speeds for his age and continues to compete across the US at trophy races. Steven Aghakhani is set to make the switch to Mercedes-AMG machinery, with US Racetronics confirming a partial season program for the 15-year-old in Blancpain GT World Challenge America next year. Aghakhani will share driving duties of a Mercedes-AMG GT3 with Richard Antinucci in selected rounds as part of an expanded program for the California-based team. It comes after Aghakhani made his pro racing debut in last month’s California 8 Hours, in a Lamborghini Huracan Super Trofeo Evo shared by Antinucci and Taylor Proto. “I’m super excited that I’m going to be competing in the GT3 class next year with AMG,” Aghakhani said. “I’ve driven Lamborghinis pretty much my entire career and am really looking forward to the challenge the new car presents. While the extent of the schedule has yet to be confirmed, Aghakhani and Antinucci will kick off the year in the season-opening round at Circuit of The Americas in March. 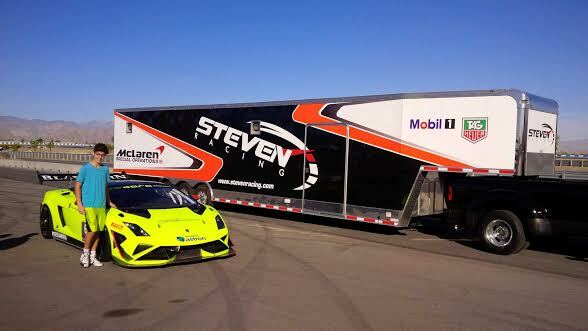 “We had great success last month at the California 8 Hours and I think it’s a good fit for Steven,” said team owner Shane Seneviratne. “He’s got so much talent at such a young age and I’m looking forward to helping him continue to develop into the world-class racer I know he can be. US RaceTronics is expected to continue its involvement with Lamborghini, primarily in the Lamborghini Super Trofeo North America series.